Shamrock stencils are a great way to create artwork for St. Patrick's Day or to make something that shows off your heritage or appreciation for Irish culture. Using free printable stencils is fun and easy, and there are also a number of other designs that you can buy for a fee. Either way, these stencils will help you create that perfect Irish craft project. Click on the image of the stencil and save the PDF file to your computer. Resize the stencil on your computer to meet your needs. Print out the stencil on very sturdy paper or cardstock or on a sticky vinyl sheet. Place the printed stencil on a cutting board or self-healing cutting mat and use a craft knife to cut it out. Affix the stencils to your project using double-sided tape. Paint the stencil using your desired method, and then carefully remove it. 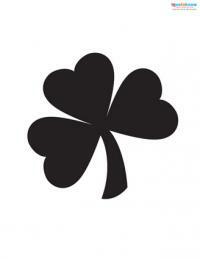 Print this straight shamrock stencil. This single straight shamrock is a simple design that won't require a lot of complex cutting. It's perfect for using with children or for embellishing something where you want some significant visual impact. Make a simple burlap table runner for St. Patrick's Day. Simply cut the burlap to your desired dimensions and tape a shamrock stencil in place on each end. Use a stencil pouncer and green fabric paint to apply the design. Create a simple stenciled T-shirt for a child. Just buy a white T-shirt in the appropriate size, apply the stencil to the front, and use a pouncer and fabric paint to create the design. Make a St. Patrick's Day party yard sign. Enlarge the stencil by four and cut it out. Using painter's tape or another low-tack tape, apply it to a piece of poster board. Use green spray paint to create the shamrock. Allow the sign to dry and then tape it to a yard stake for display. 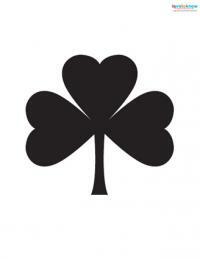 Print this curved shamrock stencil. This graceful curved shamrock is a great design that lends itself to lots of different projects. You can use it alone or in combination with other shamrocks to make some fun and festive decorations. Create a shamrock window display. Cut out the stencil and tape it to your window. Use a stencil pouncer and washable tempura paint to make a shamrock design. Allow it to dry thoroughly before removing the stencil. Make a shamrock pillow. Buy a simple canvas pillow. If possible, print the stencil on sticky paper and apply it to the pillow. Use fabric paint and a pouncer to transfer the design. Decorate a gift box. If you're attending an Irish-themed wedding or other event, bring your gift in a beautiful box. Just tape the stencil in place on a plain box and use craft paint to give it some Irish flair. 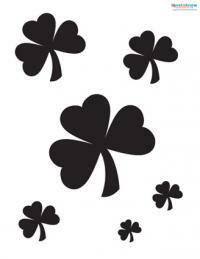 Print this multiple shamrock stencil. In some cases, it's fun to have shamrocks in several different sizes. You can use just one by cutting it out, or you can use them all together to create an all-over festive Irish design. Decorate a dresser. If you have an old dresser or stand, paint it a fun color and then use the shamrock stencils to cover it in shamrocks of all different sizes. Spray paint often works well for this type of project. Create a shamrock curtain. To give a plain curtain some extra style, use the stencils and some spray paint to make an all-over shamrock design. This can look cute at St. Patrick's Day or any time of the year. Layer the stencils on a tote bag. Purchase a plain canvas tote bag and use two different colors of green paint to create a layered stencil design. Allow the first layer to dry completely before applying the second layer. Fabric paint and a pouncer will give you the most precise results. 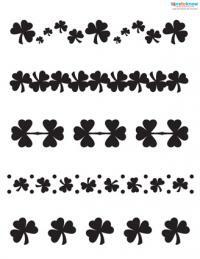 Print these shamrock border stencils. Border-style stencils can come in handy for adding that perfect Irish touch to any project. They offer a beautiful, finished look. Cutting these out can take a bit more time, but the end result is well worth the effort. 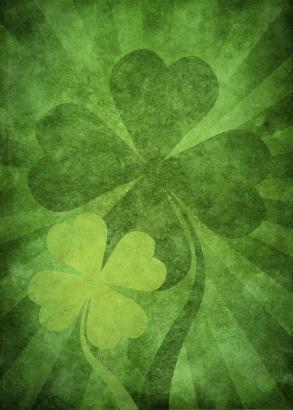 Make a St. Patrick's Day greeting card. Buy a blank card at your local craft store and use a border stencil, some green craft paint, and a pouncer to create a custom greeting. Decorate the walls of your kitchen. If you love your Irish heritage, celebrate it every day by creating a border of shamrocks in your kitchen. Just match up the edges of the stencil as you work and use interior paint to create the design. Create some festive napkins. Pick up some plain white cloth napkins on sale and use fabric paint and a pouncer to create a shamrock border around the outside edges. Custom-Size Shamrock Stencil - You can order this simple shamrock design from Stencil Planet in sizes up to 20 inches by 30 inches. You can also choose to have it printed on extra heavy material for multiple uses. The retail price starts at $15 and goes up depending on the custom changes. Celtic Shamrock Stencil - If you're looking for a stencil for paper crafting this option from Paper Wishes is a great choice. The simple three-inch design features an elaborate Celtic knot that outlines the shamrock petals. It retails for about $7.50. You can use shamrock stencils to create festive St. Patrick's Day crafts as well as everyday items inspired by the Emerald Isle. Stencils lend themselves to all kinds of creative projects, and you'll find that you use these designs in many new and unique ways.